I am head over heels for the Animal Crossing: New Leaf soundtrack. Kazumi Totaka's music is so graceful and sparse, relying as much on suggestion and space as it does on melody. But one of the best musical aspects of the game is the one you can compose for yourself. Early in the game, you'll stop by the mayor's office to talk with New Leaf's resident Leslie Knope, a chipper poodle-person named Isabelle. She's your assistant in all things mayoral, and through her, you can issue town edicts, check your approval ratings, and make a new town flag or town tune. Town tune? Yep, town tune. The town tune is one of my favorite things about New Leaf. You've got one scale and 8 beats, the equivalent of two measures of 4/4 time, to dictate the musical identity of your town. And believe me, that music really will become the town's identity. Every townsperson will sing the song to you (in their own voice, naturally) when you talk to them. Your town clock-tower will chime the tune every hour. Even the "new customer" bell on shop doors plays (unless I'm hallucinating) a super-rushed version of the tune. And when someone visits your town or sees you in their Happy Home Showcase, your two-bar musical masterwork will greet them. So. Sixteen notes to construct the aural identity of your entire town. No pressure! The composing tool in New Leaf consists of a C major scale, starting down on G and going up to E. That means you have just under two octaves to work with, and no flats or sharps. Not counting the (highly enjoyable) "x-factor" notes that we'll get to in a minute, it's pretty easy to make good-sounding melodies if you only have the C major scale, and depending on what note you decide is "home" for your melody, you can actually re-create a ton of melodies. So, trust your ear. It'll usually get you at least halfway to where you're going. Don't forget about rests and held notes. If you're trying to re-create a melody you like, don't forget that you can choose rests (the grey note at the bottom) or held notes. Count the melody in your head and try to divide it up into notes of the same duration as the notes on the screen. Remember to count the spaces if you're having trouble with the timing. Choose a "home" note based on what mood you want to impart. The two easiest moods you can impart are major and minor. Major melodies sound happier, and minor more sad or contemplative. Think of each scale as having a "home," or, the note you start on. 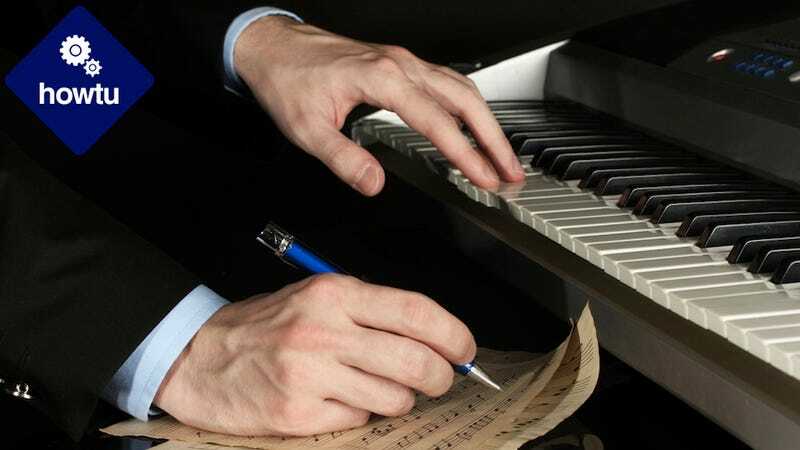 With the notes on hand, the major-sounding scales you can create start on C, F and G. The two easiest to use minor-sounding keys start on A and D.
So, if you want to make a bright/happy melody and can't get it to fit in the key of C, try starting on F and it might work out. If you can't make A minor work, see if you can make it work if you move it down to D. They're all a little bit different, so you'll have to mess around with them a bit to find the right one. The question-mark notes are amazing. I love the question-mark notes, which will sometimes play an atonal sound effect and other times will play a note from outside the C major scale (it has a fondness for high Eb, which has a nice, bluesy ring to it). Go nuts and use these, and be sure to experiment and move them around—they're different every time, and add a nice degree of unpredictability to things. If you really want to compose your own melody, the most useful tip I can offer is to pick a beginning and an ending first. Actually, pick your ending first—if, say, you want to write a happy melody in C, end it on C. Then walk backwards, figuring out where your melody will start and how it'll get where it's going. We're getting into kinda abstract melody-writing advice here, but if you want to write a good melody, think of it as a shape. Maybe it starts low and draws a line upward, ending on a high note! Or it does the opposite, and works its way down. Or maybe it starts low and ends low, with a peak in the middle? You don't have a lot of space, so you've got room for maybe three "points" on the melodic line. Look at the melodies you like, and try to trace them as a line in your mind. "Joy to the World" starts high and goes straight down. The Jurassic Park theme is a series of steps climbing upward, then angles down a bit. The Zelda theme quickly drops, then climbs up, up, up. What do your favorite melodies do? Can you come up with a similar shape but different notes? Don't Be Afraid To Approximate. Back to mimicking your favorite melodies. It's good to remember that not every melody is going to fit within New Leaf's limited scale. Sometimes you'll have to get creative, or approximate melodies. Other rhythms won't fit—you can't do triplets or sixteenth notes, so you'll have to fake it. Just remember, it may seem impossible, but if you wing it, chances are it'll still sound pretty funny/recognizable when Kat the cat meows it at you every morning. Okay, okay, enough music tips from me. Everyone just wants to put their favorite famous melodies into the game anyway, right? Here are some songs I've put together in the ACNL composing tool, for your enjoyment. You can try them out on your computer over at QRCrossing, and save the ones you like! There are many, many more. Some suggestions when I tossed this question out on Twitter: Super Metroid, Fire Emblem, Roslin and Adama's theme from Battlestar Galactica, the opening to New Bark Town in Pokemon Gold and Silver, the intro to "Dueling Banjos," Jurassic Park (or really, any John Williams anthem), "Moonlight Sonata," "Elegy of Emptiness" from Majora's Mask, and perhaps best of all, the sax theme from Men at Work's "Who Can It Be Now." The possibilities are almost endless. With that, I turn it over to you guys. What music do you use for your theme? Bonus points if you can post a photo of how you did it.